Block (w: 0.31 x h: 0.50 x d: 0.52) of coarse brown limestone. Inscribed on one face, perhaps part of a monumental inscription. Lepcis Magna: Wadi Lebdah; Seen by Delaporte in 1806 built into the same late tower as 819 on the level around East of it. Corpus Inscriptionum Graecarum 5363b: Corpus Inscriptionum Latinarum VIII:10998 = 22685b. This edition taken from J. M. Reynolds and J. 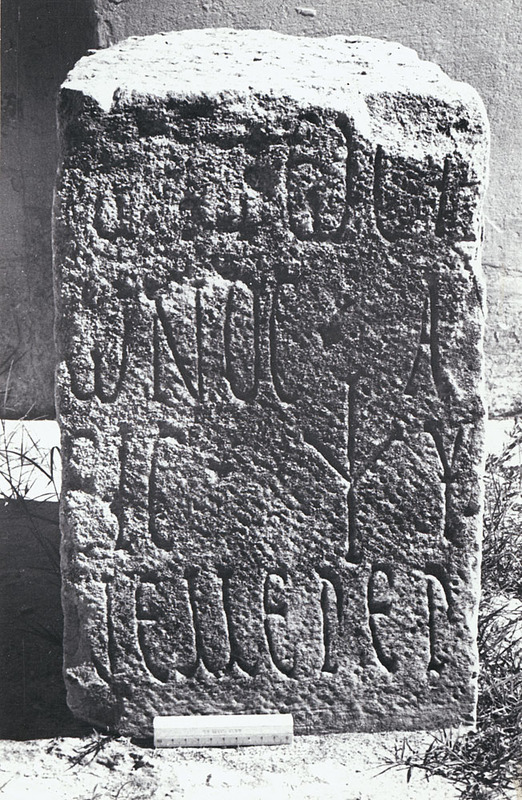 B. Ward-Perkins, The Inscriptions of Roman Tripolitania, Rome: British School at Rome, 1952. 4, The reading is clear, and the suggestion in CIL that this was a transliteration of benemerenti must be rejected.